Mix and stretch for 5 minutes, rest 15 minutes, stretch 5 minutes then rest 1 hour. 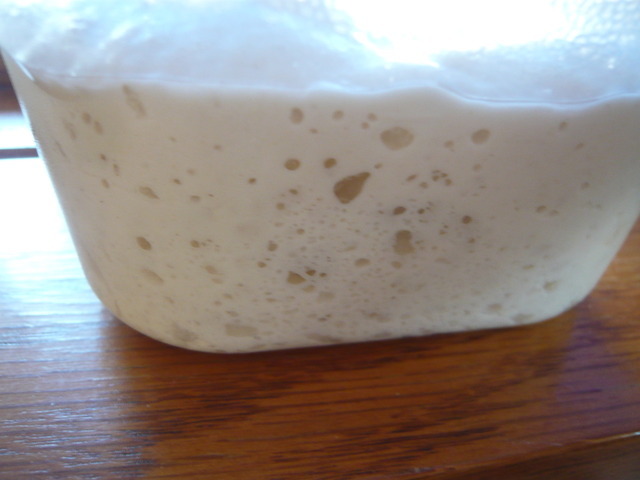 A dough at this hydration is very wet and sticky, but should be uniform at this point. I do the mixing with my fingertips. Divide in two and cold ferment in a covered container in the refrigerator for 1-4 days. Stretch into pans greased lightly with vegetable shortening and allow to rise 3 hours before topping. In my oven, they bake for 17-19 minutes in the bottom of the oven at 475F. The pans cut nicely into 4 pieces so everyone gets two of the crispy edges. 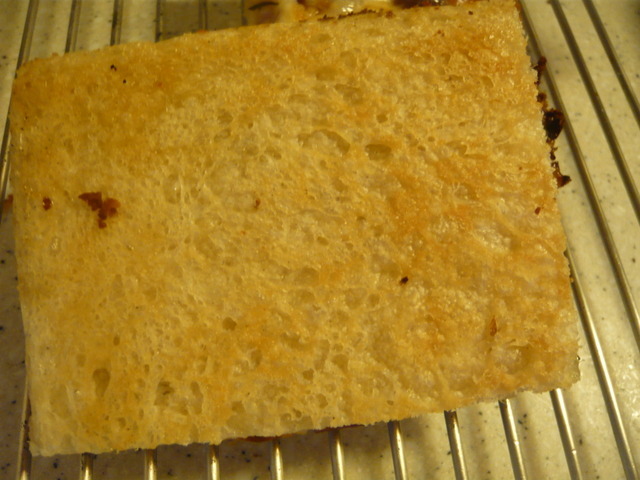 The crust should be light and airy and the bottom of the crust should be lightly toasted like a grilled cheese sandwich. I've been topping with 2 oz. mozzarella, 2 oz. provolone, and 2 oz. white cheddar for the cheese. 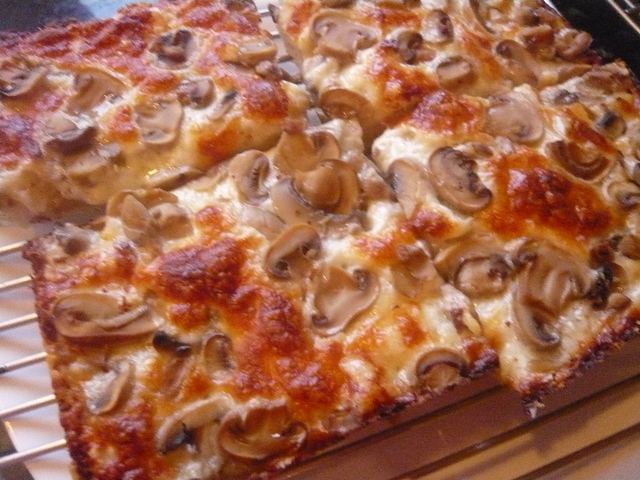 Brick cheese is another common choice. 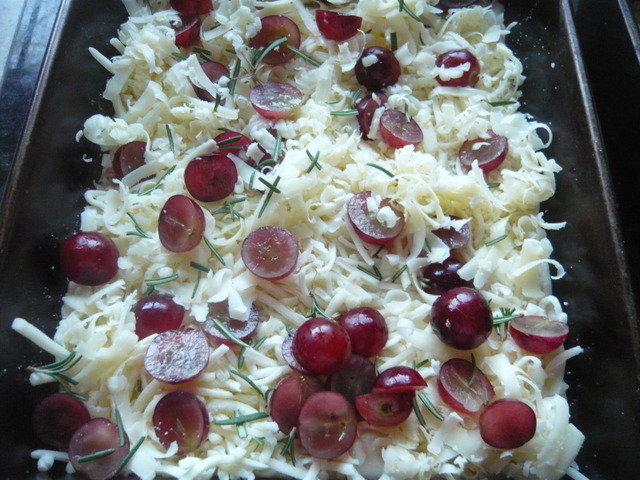 The cheese or blend of cheeses needs to be one that will give a nice browned edge when pushed out to the pan. 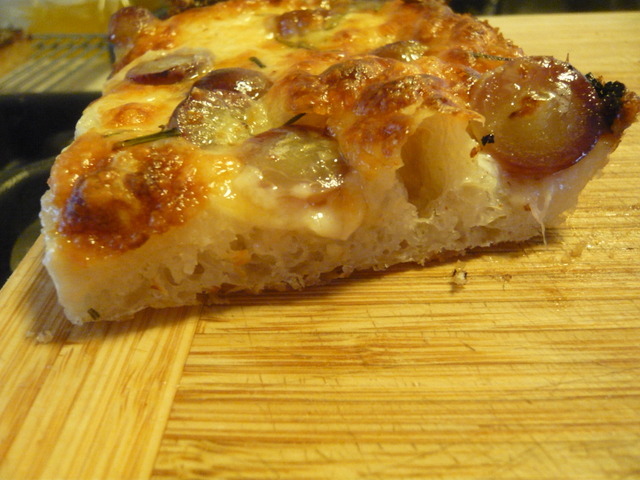 One of my favorite pizzas has red grapes halved, fresh rosemary and a little olive oil at the end. 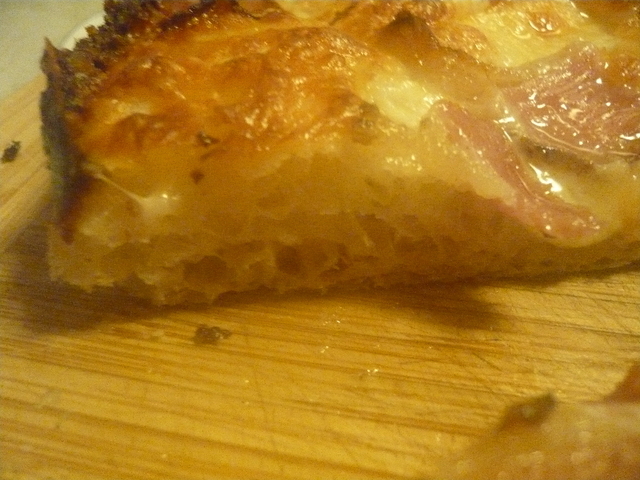 It is a version of a Tuscan bread called "schiacciata all'uva". The flour I use; AP should work as well. 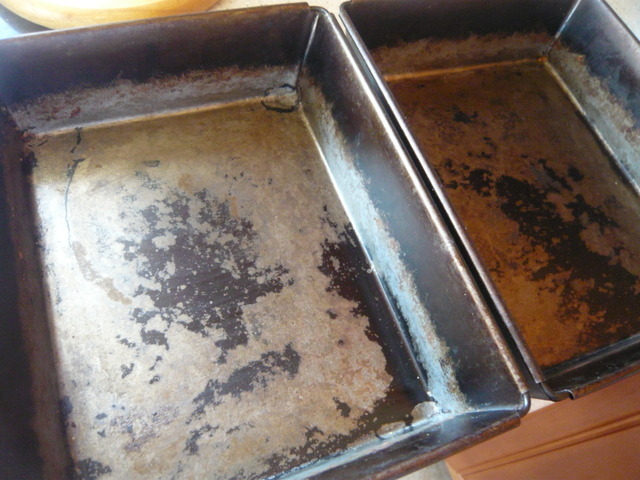 Pans of this type were used in the auto factories as parts containers so were plentiful and cheap. 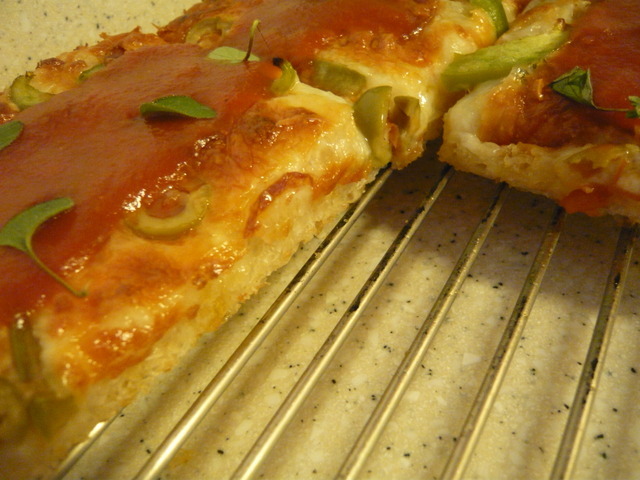 Another pizza topped with bell pepper, chorizo Austurano, and green olives. Chorizo is a great alternative to pepperoni in my mind. Sauce and fresh oregano added post bake. 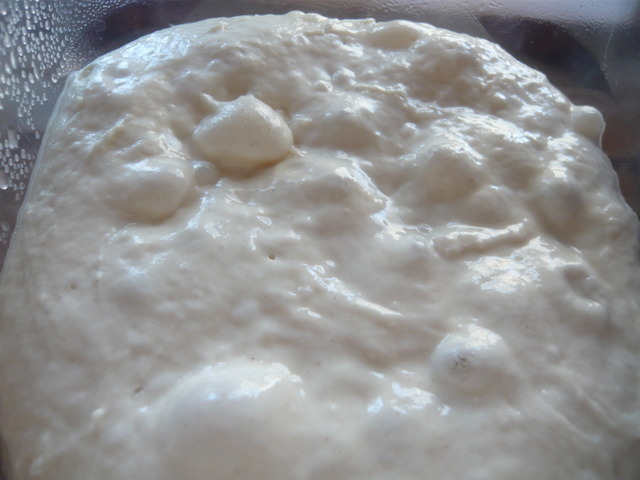 The sauce is often added this way to help the wet dough cook properly. 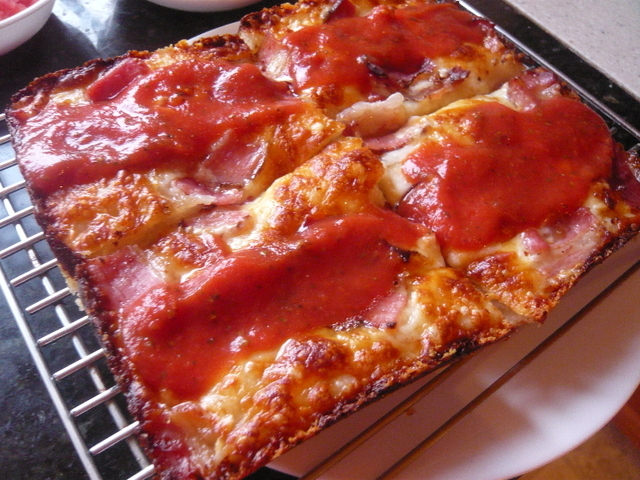 Move the pizza to a cooling rack to keep it from steaming the bottom crust and losing the texture. 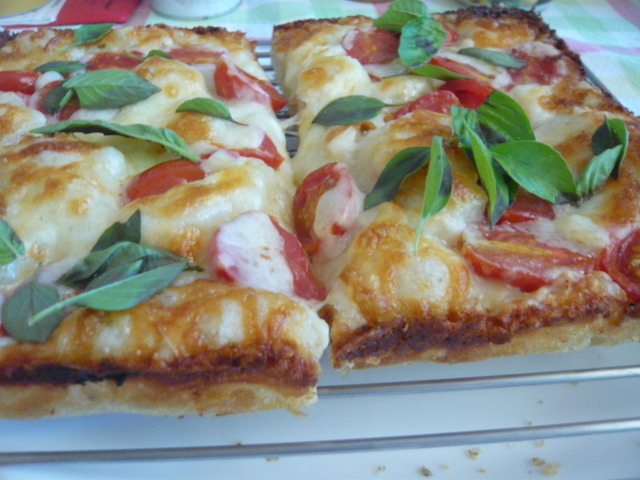 I usually only add a bit of salt and sugar to canned tomato sauce, sometimes some pizza herbs. 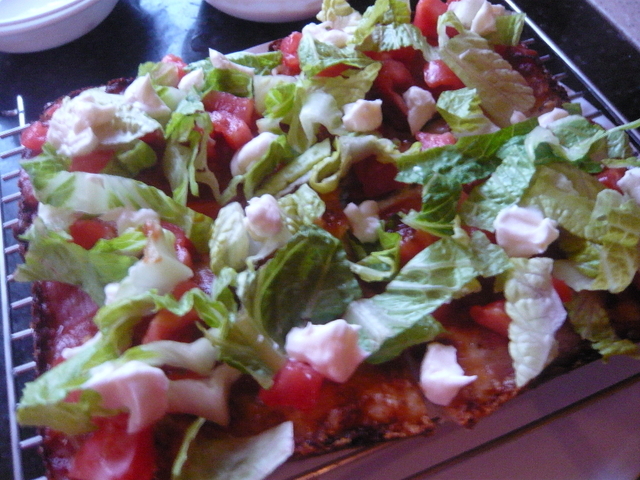 Finish with diced tomato, romaine lettuce and a few dabs of mayo; BLT pizza. How the hell did I miss this post?! This looks awesome! Wait... you put the sauce... on top of the cheese...?!?! Usually sauce on top to help the wet dough to cook better. Try it each way to see which you prefer. I'll do the same because pizza. Wow! 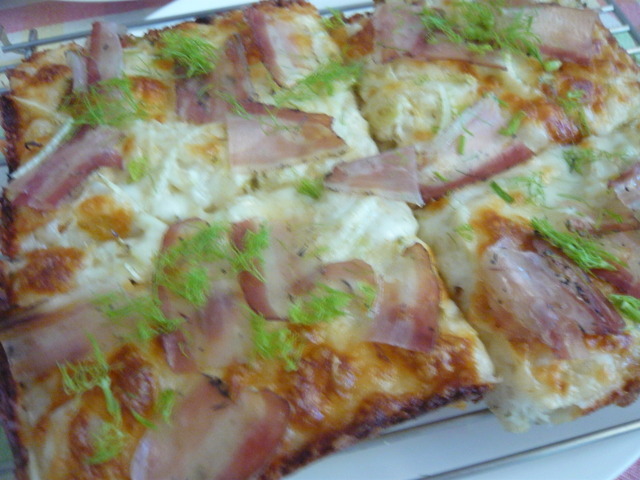 The pizza looks great!!!! They look superb, and the detail about the pans was new to me. Thanks Paul. 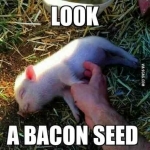 Those look amazing!! 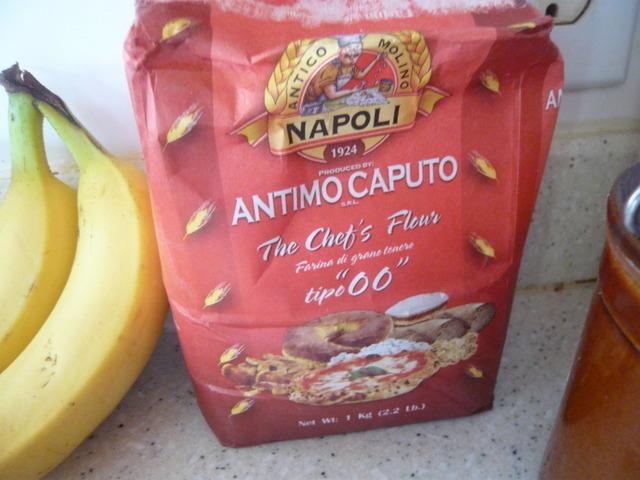 I am big on the Napoli "00" flour and I would go so far as to say while all purpose can be used as a substitute, if you can get the "00" flour (usually a good Italian grocer will carry it) you should. Since I have been making pasta and pizza dough with this flour it has turned it from a "pretty good" dough to an "amazing" dough. I never realized how much that flour could affect my outcome until I inquired with a source at the oldest - and my favourite - pizzaria in Toronto and he divulged the secret flour. 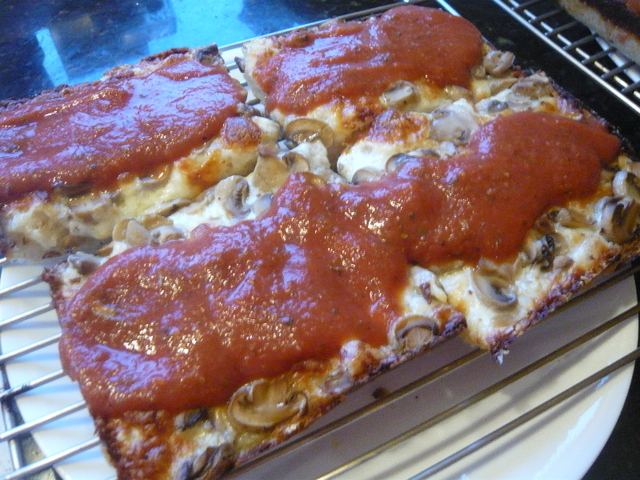 Also, for sauce going with a very simple sauce using high quality San Marzano canned tomatoes also makes it. 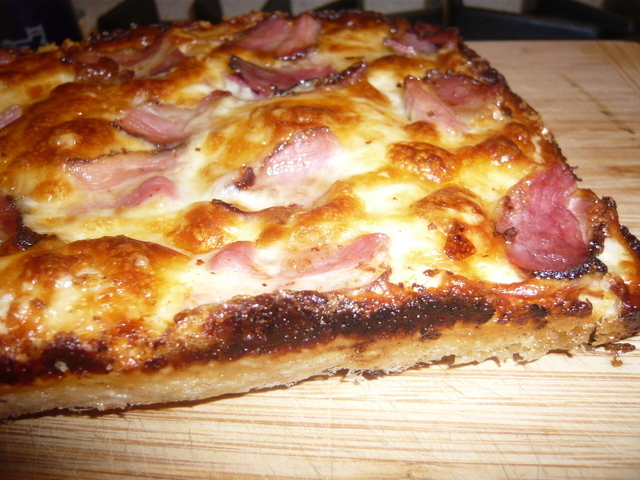 Just a quick question as I would like to try your dough recipe, it looks awesome! I have two 13" round heavy duty professional pizza pans. I can't figure out the conversion (I've had brutal strep the last few days, 104°F temperature and spent all day yesterday in the hospital on multiple IV/morphine drips since I couldn't swallow anything or even stand from the body pain - ok enough complaints, boo-hoo and all that, lol) So would I be able to divide your recipe in two to fill the pans or would I need to increase amounts? You have done what seemed impossible yesterday, you made me starving hungry and considering I haven't eaten in almost 3 days I suppose anything would but seriously, those pies have set the craving, I now NEED to eat them too! Great job and thanks in advance NCPaul! 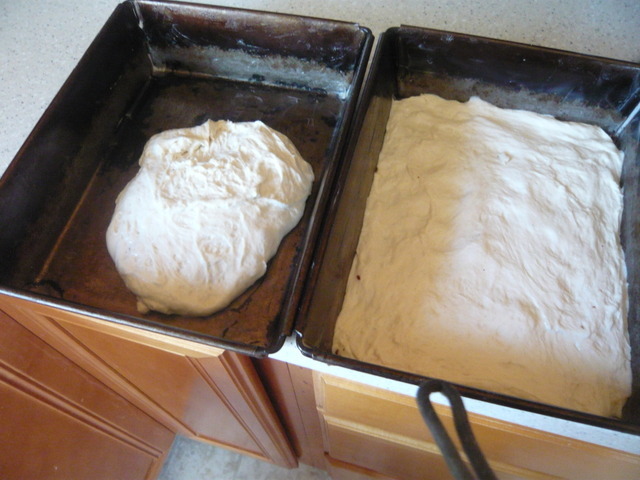 Multiply my dough formula by 1.5 to make two 13 " pies. You'll need about 12 oz. of cheese per pie. One of my favorites that I haven't posted yet is the pep-pep-pep-pep. You top the pie with pepperoni and green bell pepper before baking and add chopped peperoncini (yellow pickled peppers) and peppadew (sweet bright red peppers) after the pie is done with just a couple of sauce circles to finish. It is worth the effort to do this one, trust me. Please post the pictures; that pie will make you a legend. I'm glad you are recovering. NCPaul wrote: Multiply my dough formula by 1.5 to make two 13 " pies. You'll need about 12 oz. of cheese per pie. One of my favorites that I haven't posted yet is the pep-pep-pep-pep. 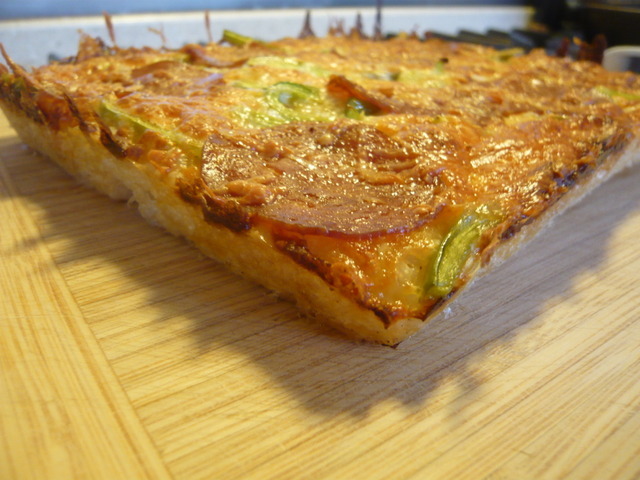 You top the pie with pepperoni and green bell pepper before baking and add chopped peperoncini (yellow pickled peppers) and peppadew (sweet bright red peppers) after the pie is done with just a couple of sauce circles to finish. It is worth the effort to do this one, trust me. Please post the pictures; that pie will make you a legend. I'm glad you are recovering. 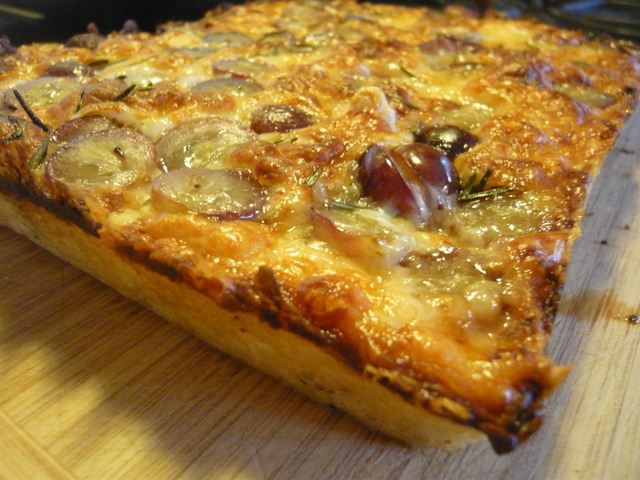 Many times small amounts of pizza toppings can be found on grocery store salad bars.